To commemorate Filipino culture and traditions, Intermediate pupils celebrated Buwan ng Wika with a theme, “Wikang Filipino: Wikang Mapagbago” all throughout the month of August and held a culminating activity to mark its end on August 29. As the highlight of the events, Poem Interpretation of pupils from Grades 4-6 was held. Maria Alessandra B. Endaya from 4 – Rhenium, Denver A. Jimenez from 5- Strontium and Ashley Neil M. Ariola from 6 – Thallium bagged the First place while Alethea Ghaille M. Edades from 4 – Uranium, Rjay Neil D. Bañas from 5 – Silicon and Methelyn B. Cutad from 6 – Thorium succeeded the Second place whereas Charloumyr Joy B. Gutierrez from 4 – Europium, Marian Lovie A. Francia from 5 – Stradium, and Maria Beatrice B. Endaya of 6 – Titanium emerged as Third place winners. The artistic skills of Grades 5 and 6 pupils earned them awards for Poster Slogan contest. Rjay Neil D. Bañas of 5 – Silicon and Maria Beatrice B. Endaya of 6 – Titanium bagged the First place, Zophia Audrey J. Obejera of 5 – Scandium and Camille Jone B. Miclat of 6 – Tungsten grabbed the Second place and Natalie Doreen S. Cruz of 5 – Nobelium and Ashley Neil M. Ariola of 6 – Thallium won the Third place. In line with the celebration, the Pinoy Merienda campaign of Grade 4 pupils and the fashion show of Grade 6 pupils were held to exhibit the Filipino culture. 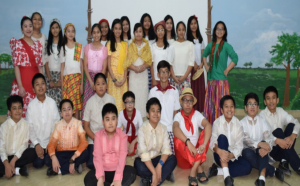 The pupils brought Filipino delicacies and wore Filipino traditional costumes.